Second chance! This popular Indiana Jones print is back! Gallery-wrapped canvas print by artist Eric Tan. Inspired by Indiana Jones and the Last Crusade. 495-piece edition measures 18-inches tall x 8 2/5-inches wide. Eric Tan's super-popular and sold out Indiana Jones print is back and now available as part of Acme Archives' Gem canvas collection! Have the adventure of your life keeping up with the Joneses with this Indiana Jones Have the Adventure of Your Life by Eric Tan Gallery Wrapped Canvas Giclee Art Print. Wrapped around a 1 1/2-inch wooden stretcher bar, it's ready to hang on your wall or give as a gift. 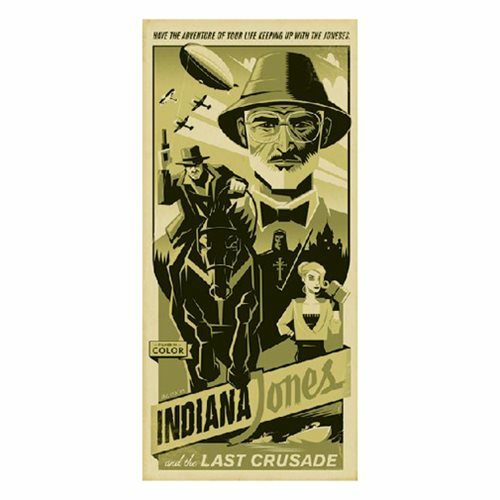 Inspired by Indiana Jones and the Last Crusade, the 495-piece edition measures 18-inches tall x 8 2/5-inches wide. Giclee (pronounced "zhee-clay") is an invented name for the process of making fine-art prints from a digital source using inkjet printing. The word was coined to distinguish commonly known industrial "Iris proofs" from the fine-art prints artists were producing on the same printers. The name has since come to mean any high-quality inkjet print and is often used in galleries and print shops to denote such. In the past few years, the word (as a fine-art term) has come to be associated with prints using fade-resistant "archival" inks and the inkjet printers that use them. A wide variety of substrates are available, including various textures and finishes, such as matte photo paper, watercolor paper, cotton canvas, or artist textured vinyl.